Today, motorhome hire is getting more and more affordable, and as companies look to make it more attractive for holidaymakers, it's important to be aware of just what the costs can be. While motorhome hire is a great way to enjoy a holiday, it's important to prepare well so that you have as much to spend on your holiday. Looking at motorhome hire costs, there's typically two main components with the first one being the hire price of the vehicle and the second being security deposit and any additional items you may need. Depending on the hire company you choose, motorhome hire costs can vary significantly, so it's important to look around to ensure that you're getting the best possible deal. At the same time, you can also see for yourself just how luxurious a motorhome can be! Typically, motorhome hire rates have a minimum three-day period up to a few weeks or even months. When booking, try and ensure that you leave enough time for your holiday, because late fees can be expensive and sometimes are in the region of £50 per hour or more. To save on motorhome hire costs, you may find that renting for one additional day gives you peace of mind that if there is a problem, or you get delayed, there's plenty of time to get the vehicle back safely. With more and more companies offering motorhome hire, motorhome hire costs are getting cheaper by the minute. However, it's important to choose a motorhome company on more things than just price alone. After all, many budget providers may simply hire a vehicle with a few items of cutlery and a gas bottle, whereas other businesses will provide a welcome kit, towels, blankets, pretty much everything. Depending on where you hire, it may be easier to pay that bit more if it makes your life simpler. After all, it's a holiday! Additional extras such as GPS, bike racks and even bicycle hire can be rented at many motorhome hire companies. The motorhome hire costs for accessories aren't expensive and they really can make your holiday more enjoyable. 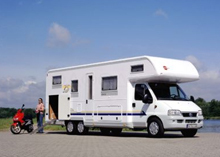 In addition to looking at motorhome hire costs it's always important to check out the insurance and breakdown cover. Take a look at excess charges and who can actually drive the vehicle. Typically if the driver is under 25 or over 70, there may be additional charges to pay, likewise you may also have to pay a bit more if you're travelling to Europe. Prices range drastically for these 'extras' so if it seems too expensive, talk to another company. Finally, when looking at motorhome hire costs, there is always a security deposit to pay which can be around £700. Typically, this comes off your credit card when you take the vehicle and once you've returned it safely, they'll refund you the deposit. Depending on where you book, the amount can change and while some companies may actually debit your account, others will simply hold your bank details for guarantee.